Kids and dogs – the best kind of story. Just about everyone can recall that feeling of dread when you were called on to read aloud in class. But for some students, these moments of dread can develop into a serious and growing problem known as aliteracy: acquiring basic reading skills, but disliking, or even refusing, to read. Because aliteracy can usually be traced to feelings of fear, shyness, and embarrassment, the best way to combat the problem is to find a way for kids to read in a fun and empowering environment. That’s where our Share a Book program comes in. We work closely with local teachers, reading specialists, and librarians to help children improve literacy skills while offering them an opportunity to have fun reading—to dogs! Share a Book’s volunteer animal-ambassador teams teams visit schools, libraries, book fairs, after-school programs, reading labs, and community outreach events, bringing smiles and confidence to the kids they meet. Dogs are ideal reading companions because they offer unconditional love and acceptance. As opposed to an audience of their peers, kids feel comfortable reading to dogs because their fears and limitations dissolve in the process. 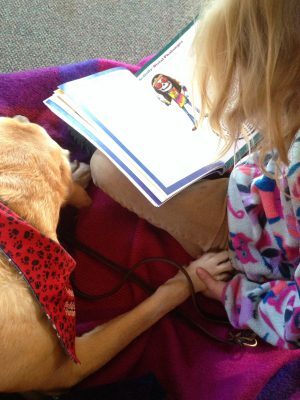 Plus, a child who lacks self-esteem as a remedial reader gets the chance to become a “teacher” by explaining what they’re reading to their canine partner. There are also physiological benefits of being with dogs, including lower blood pressure and increased relaxation. In this calm environment, kids tend to forget about limitations. It doesn’t take long before we see marked improvements in reading. The most evident improvement is in the child’s confidence and desire to read. Several studies have shown very positive results, which you can read about here. Before participating in the program, dogs and their humans complete a seven-week training class to become an animal-assisted therapy team. After becoming a team, there’s an additional three-week training class to learn the many ways their dogs can be an integral part of the reading sessions. To become literacy mentors in the Share a Book program, the dogs must pass the classes and have a health record completed. Head to our event calendar to see when Share a Book is coming to your local library. Read a profile on Share a Book volunteer Kathie Meier. And check out this heartwarming video about the impact of our program! For more information on bringing the Share a Book program to your school or library, to have your child participate in a reading session, or to become a volunteer team with your dog, please contact the Community Engagement department.